Adobe's Flash Player is the key to the internet's most used technology called Flash. Nowadays Flash can be considered one of the internet's basics. Therefore it has always been targeted by hackers, malware authors and so on. Adobe tries to keep up with those by offering security updates - but although Flash offers update checks itself, many systems run outdated and insecure Flash Player versions. That is a huge security risk which must be eliminated. Alternative Flash Player Auto-Updater let's you download and install the Flash Player without having to download Adobe's download manager - it downloads the latest version and asks you whether it should be installed or not. 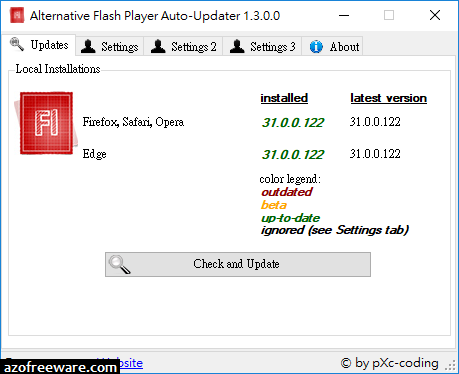 You can choose to let it run at the start of Windows, this way you can be sure that your system will never run an outdated and extremely dangerous version of Flash Player.